The Color of Law by Richard Rothstein is a great read bestseller. Living between the Pacific Northwest and San Francisco, I can truly relate when the book started with the state of residential racial segregation in San Francisco, CA. A good example is that San Francisco nowadays has outlived New York and any major metropolitan city as the highest cost of living as well as one of the highest in rent and home purchase. Thus a good example is the Ellis Act. The “Ellis Act” is a state law which says that landlords have the unconditional right to evict tenants to “go out of business.” For an Ellis eviction, the landlord must remove all of the units in the building from the rental market, i.e., the landlord must evict all the tenants and cannot single out one tenant (for example, with low rent) and/or remove just one unit out of several from the rental market In the Color of Law as mentioned in the book, it is concerned with consistent government policy that was employed in the mid-twentieth century to enforce residential racial segregation. Hence that was a time that African Americans and Whites cannot live in the same building. Thus San Francisco for example is where the Rev. Cecil Williams founded the Glide Memorial United Methodist Church coinciding with the the Martin Luther King and Rosa Parks era and revolution. 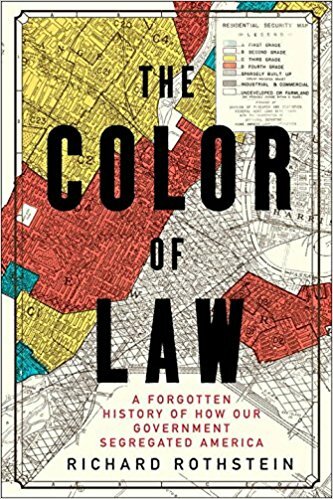 From zoning ordinances to public housing as discussed in the book, there's still a huge segregation and thus the disconnect. The book has several number of pages solely on Frequently Asked Questions. From author, Ta-Nehisi Coates says he would pay reparations to African Americans to the author's notes citing his stint with the Economic Policy Institute in developing The Color of Law. This book is indeed a great read on the topic and from the last I've heard, the publisher is now printing additional copies due to demand. I would end he topic again in an affordable housing program called Below Market Rate, In this program developers that build skyscrapers and multi development condominiums for example are required to dedicate and unit or building which can be sold a Below Market Rates. This is a great program to be able to purchase a property if your in the low to medium income bracket and do not have much cash to put in towards the purchase. The sad reality is that the lenders or banks in this program themselves sometimes get listed as accredited but when to contact them they will state they are not with the program. Worst scenario is that even with such programs, there's still no way to raise a 10-15% downpayment and closing cost just to get a home mortgage. When you get to finally read this book, you'll better understand what the inequalities are specifically on housing.